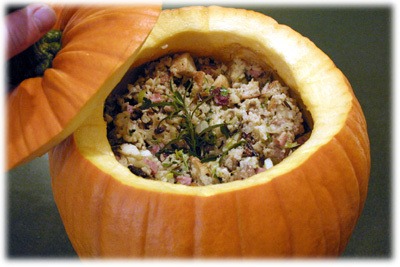 Not only is this the best stuffing recipe you'll ever taste - but you make it and serve it in a Pumpkin! Take plain old turkey stuffing to new levels and impress your guests when you make this the centerpiece for Thanksgiving dinner. All you need to do is make this once and you've started a new family tradition. 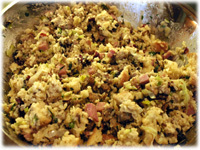 The really great thing about this sausage and wild rice stuffing recipe is that you can change it to a Crock Pot stuffing recipe for Christmas and skip the pumpkin. 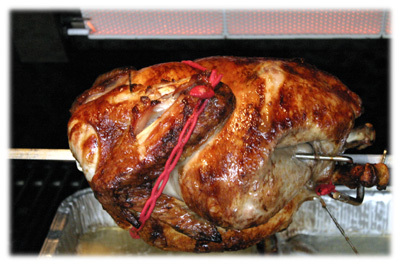 And while you're at it, why not make your whole Thanksgiving dinner on the grill and make this Rotisserie BBQ Turkey to go with your turkey stuffing recipe. This recipe's been adapted and perfected from several others I've collected over the years including one from the Big Green Egg cookbook for Eggheads. Tip: if you can't find sourdough bread then try french baguettes or pumpernickle. If all else fails use plain white bread. Tip: if you can't find bulk sausage use premade Bratwurst sausages and remove the casings before frying. 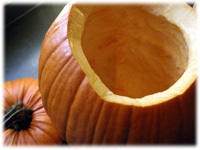 Cut a lid from the pumpkin and scoop out the innards as if you were going to make a jack 'o lantern. Pierce the inside of the cleaned pumpkin with a fork but don't cut through to the outside. 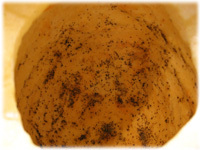 Rub salt and pepper on the inside walls of the pumpkin. In a large sauce pan bring the chicken broth to a boil. While the rice is cooking spread the bread cubes on a lined cookie sheet and sprinkle dried sage over the pieces. Place in a preheated oven at 275F for 20 - 30 minutes flipping the bread cubes at least once. Cook until the cubes are slightly toasted. Alternatively, a day in advance season the bread cubes with ground sage and let them air dry out at room temperature until they're stale. 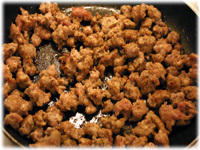 In a large sautee or fry pan break up the sausage and sautee until browned over medium heat. If you're using bulk sausage then sprinkle some dried sage and black pepper over the raw meat as it starts to cook. 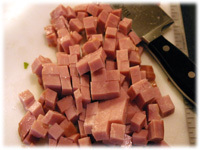 If using premade sausage removed from their casings then no extra seasoning should be required. Remove from the pan when cooked, cover and set aside. In the sautee pan used to cook the sausage add the butter until melted over medium heat. 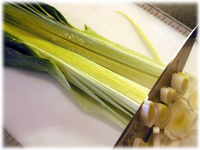 Add the chopped leek, onion, green onion and garlic. Sautee for several minutes until the onion begins to soften. Add the chopped ham, apple and cooked sausage and let simmer until heated through. In a (very) large mixing bowl combine the cooked rice, bread cubes, the sausage ham & onion mixture from above and the beaten eggs. Add the dried cranberries (Craisins) and raisins. Add the fresh thyme and sage and some salt and pepper to taste. Stir well to combine the stuffing. 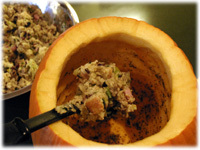 Spoon all of the stuffing mixture into the pumpkin. 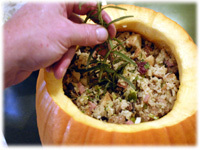 Once you've spooned all the stuffing into the pumpkin insert a sprig of fresh rosemary down into the center of the mixture. Place the lid on the pumpkin. Preheat the BBQ or grill to 300F - 325F and set up for indirect grilling. 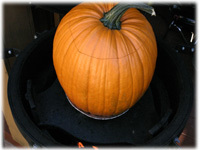 Place the stuffed pumpkin in a disposable aluminum pan and place on the BBQ. Cook for 3 hours (or until the internal temperature reaches 180F). 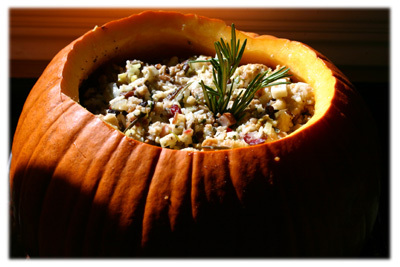 Remove from the grill and carefully present the pumpkin with a spoon so your guests can scoop out their stuffing. The pumpkin will be softer after cooking so take care not to damage it.